Earlier today my needed to reset a long list of items in a SharePoint list. This task is best achieved in ‘data-sheet view’, since the alternative is to manually edit each entry. Not my idea of fun. SharePoint 2010 does have some well-documented foibles with 64-bit installations and having recently also been looking into a problem accessing Nexus with Internet Explorer 11 (and getting the ‘light’ version of Outlook Web App) I was inclined to assume that this would likely be down to something similar*. In this case though, the problem wasn’t IE-specific – it applied equally to Opera, Chrome and Firefox – which wasn’t a huge surprise, given that ActiveX compatibility was cited as one of the potential reasons. I run a 64-bit version of Windows 8.1, also with a 64-bit version of Office 2013. For reasons best known to themselves, Microsoft have decided that the latest version of Office shouldn’t come by default with the Data Connectivity Components required to use SharePoint 2010’s data sheet editor. 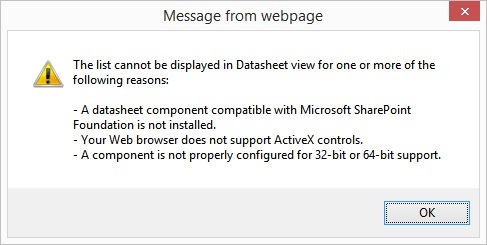 Effectively Office 2013 was missing a load of ActiveX DLLs. Fortunately there is a solution. As a user of Office 2013 the version number on this fix made me wince a little but it does work: what you need in this situation is the Office 2007 System Driver: Data Connectivity Components. Make sure that you are using the 32-bit version of Internet Explorer once this is installed and your datasheet view should be reinstated. * For reference, the issue causing Outlook Web App to load the ‘light’ version with IE11 relates to Microsoft’s (belated) attempts to embrace compatibility standards. The ‘MSIE’ token has been removed from that browser’s user-agent identifier string, to ensure that the old CSS hacks and workarounds required on some sites – to support IE6, 7 and 8 – aren’t inadvertently sent to IE11, now that they are no longer needed. Thanks a lot for this solution mate, I was having a difficult time figuring out the root cause for this problem. Isn’t it strange that MS has left such a obvious thing for toss?